This handmade ballpoint pen would make a nice gift for yourself or someone else. 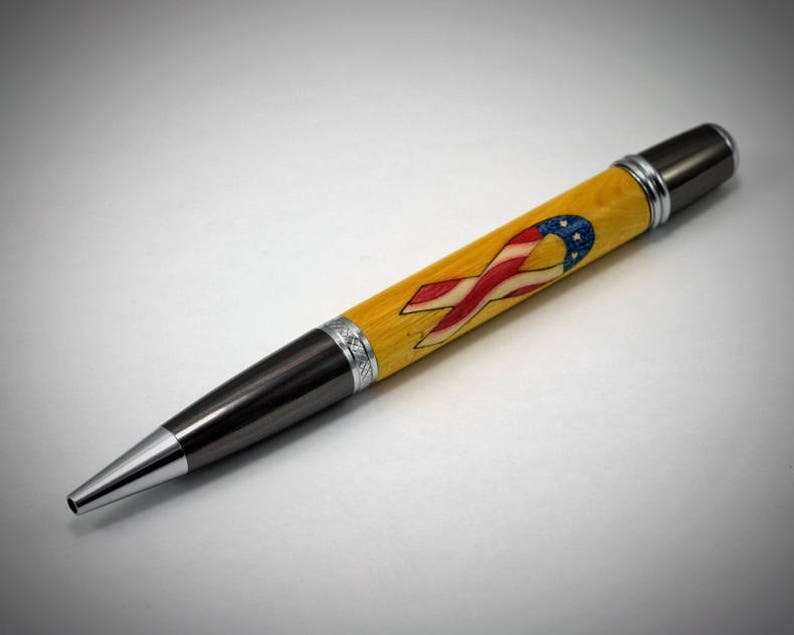 This wooden pen is a Patriotic Pen. It is made of dyed and stabilized hardwoods that are segmented to depict a Patriot Ribbon consisting of the red, white and blue of an American flag. The components are chrome and gunmetal. If you are looking for a nice pen as a gift to yourself or someone else you have just found it! The classic pen that is pictured is the pen that the buyer will receive. For a 360° view of this pen copy and paste this URL to your browser. Ohio Penworks purchased the blank for this pen from a 3rd party. The segmentations were laser cut from dyed and stabilized hardwoods. Each piece had to be fitted into a corresponding cutout, much like a jig-saw puzzle is put together. The correct size brass tube is glued into the blank and the ends of the blank were sanded flush to the brass tube.